Many residents holding signs which read “Don’t widen 270 & 495,” and even a person in a dinosaur costume, gathered at a meeting presented by Maryland transportation officials. ROCKVILLE, Md. — Montgomery County residents raised concerns, such as losing their homes, over plans to widen Interstate 270 and the Capital Beltway. 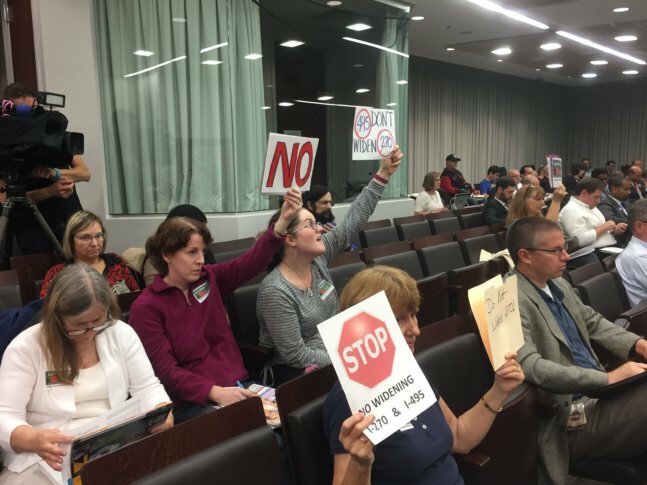 Many residents holding signs which read “Don’t widen 270 & 495,” and even a person in a dinosaur costume, gathered at a meeting presented by Maryland transportation officials Thursday night. This comes after the state announced it is studying ways to move cars faster through the area, with options such as the widening of I-270 and the Beltway, and the formation of a private-public partnership that would bring toll lanes to the region. Many of those in attendance live along I-270 and the Beltway in Montgomery County, and they expressed their concerns that plans to ease traffic congestion on the interstates could cost them their homes. “We’re concerned about people’s homes being taken,” council member Sidney Katz told Maryland Secretary of Transportation Pete Rahn. Katz and others county and state officials pressed the state on the concern, and while Rahn stopped short of agreeing to a binding written agreement, he said the focus is on working with state right of way land for the projects. “What I have said, in fact what the governor has said, is that we will not be taking homes,” Rahn said. Congestion on interstate 270 and 495 in the National Capital Region is bad, and the state said congestion issues need to be addressed as the area’s population is expected to reach 1.3 million people by 2040. Rahn said the state has planners looking at numerous options — which include toll lanes, no toll lanes, and no changes at all — and that the state is very early in the process. State senator Cheryl Kagan, a Democrat who represents the Rockville and Gaithersburg areas, said the state, so far, has failed to hold meetings in areas that will be affected the most by any construction. “I encourage you to please make this process transparent and inclusive, whatever decisions are made,” Kagan said. Rockville resident Linda Dominic, who lives along I-270, said that without something in writing, she remains skeptical about Gov. Larry Hogan’s and transportation leaders’ promise that no homes will be taken to achieve the road widening. “Everybody’s very suspicious,” Dominic said. Rahn said concessionaires looking to build, manage and operate toll lanes have been told that during the procurement process, they should stay within state right of way with designs. “We are minimizing impacts. We’re not going to take homes. Beyond that I don’t know how much more we can say,” Rahn said. The state said it is studying potential designs, which include reversible toll lanes, cars-only tunnels and “cut-and-cantilever” tunnels that use lower-level toll lanes and even express bus lanes. “If they stack the Beltway up two lanes high, instead of taking road, then what is that going to do to the sound,” said Silver Spring resident Walton Smith, who lives along the Beltway. Residents can submit comment and options to state officials through the project’s website.